In this modern era of digital technology, do you find yourself missing the good old fashioned sturdiness and comfort of a hard copy novel? Have you ever been hanging on that last page only for your kindle or smartphone to run out of battery? Then Books R Us is for you! As well as being reasonably priced. 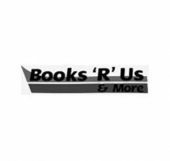 Books r Us offers a more personal and unique alternative to broader franchises. They also boast a large selection of calendars, diaries and notebooks. So if you’re a book worm, then this is the place for all your fiction and non-fiction needs.